If you know a bit about Barcelona, you’ve probably heard about Poblenou. This neighborhood, which used to be an industrial district, has become one of the most avant-garde areas in the city thanks to big doses of design, innovation and sustainability. Time ago, in a previous post, we told you about how to discover all the corners of the 22@, and today we take up this topic again to propose you 5 options to make the most of your stay in our hostel. There we go! The location of our hostel, the neighborhood of Poblenou, is the perfect starting point to start discovering Barcelona. Located just a few meters from the beach, and very close to the city’s main attractions, our hostel has a wonderful terrace with spectacular views. Besides, its excellent connection with public transport services, makes it accessible even from the airport. And this journey takes 35 min only! Play with our WII or, if you prefer analogical entertainment, with our pool or some of the board games that we have. Watch the TV or use the projector to enjoy a TV serie or film with other guests. You could even practice other languages! If you prefer an intermediate plan, between staying at the hostel or going out, you can’t miss a meal at the Carrot café, which is located just next to Twentytú Hostel. Its gourmet sandwiches are out of this world! And, as we know little details are important, we present those guests who book a double room with breakfast a delicious croissant. Yummy! 4. Need more reasons to stay at Twentytú? Ok, here’s one more! The atmosphere at the hostel is warm and friendly, so we are sure you’ll have a great time, no matter if you come with your couple, friends, family or alone. And what is more, at the same time you enjoy you stay, you’ll be taking care of the planet, as we are a certificated eco-hostel. Enjoy Barcelona, discover Poblenou and rest in Twentytú! Learning languages ​​is an unresolved matter for many people due to lack of time, resources or places to practice. That’s why the language exchange ​​with native speakers is an entertaining, informal and effective option to learn and, above all, to enjoy it! We tell you all the tips that you must consider to make the most of the language exchange in Barcelona, ​​there’s no excuse! For a linguistic exchange to work, the participants must have a similar level of the language they wish to learn, so in this way the vocabulary will be equivalent and the conversations will be enriched. Introduce yourself: who you are, what your origins are, where you live. It explains all the basics that the other person should know to know you. Explain what your job is and what you like to do in your free time…your profession and your hobbies say a lot about you. Talk about the language you want to learn: why you do it, which your weak points are, which tricks you use to improve it, etc. Tell them things about your family and your pets. Surely you have interesting anecdotes and funny stories for your listener. List your favourite tastes and hobbies: movies, series, books, records … surely you’ll have one in common with your language exchange partner. Discuss the trips you have made or would like to make. Talking about countries and cities will also give you the opportunity to talk about different habits and cultures. Gastronomy: explain your culinary habits, your favourite dishes, recommend restaurants or products. Everybody eats many times a day so we’re sure that exchanging tips will be very useful. To improve your understanding and accustom your ears to the different accents, try listening to a podcast before a language exchange session, this way you’ll improve listening and prepare yourself mentally to adapt your language. Search for radio programs, narrated books or do a marathon of your favourite English-speaking series in original version. Practice pronunciation and check the most frequent expressions and informal jargon. And remember, the more you like the topic, themore fun you’ll have! Take note and review all the corrections that your interlocutor points out about your speaking, because the faster you memorise them, the fewer times you’ll repeat your mistakes. Also keep in mind which your weak points are and try to face them and review them as many times as necessary. And above all don’t worry about making mistakes, because as the poet Goethe says: “The only man who is not wrong is the one who never does anything”. Make an effort so that the learning process is mutual and equitable. It’s important that half of the session is in one language and the other half in the other, for example in sessions of 15 / 15 minutes or 30 / 30 minutes. As the time passes and you feel more comfortable, you’ll increase the difficulty of the topics and the registers. In this way you’ll progress safely! Technology is your friend when it’s time to learn a language: it will allow you to check contents, connect with other people, record and listen to your conversations or use apps or websites that allow you to learn while playing. Internet is a great source of didactic material and you can went to websites like Busuu, apps like Duolingo, or join social network groups where there are people with your same interests, you’ll see how you find a lot of information! Read books or magazines in the language you want to learn, watch original untranslated content, attend Meetup events, find out what your city’s exchange options are, or enjoy relaxed chats at one of the language exchange bars in Barcelona that we offer. The key is practice! This year, the Llum Bcn festival will illuminate all the streets of Poblenou and other spots of Barcelona with its big variety of activities and shows, as part of the famous Santa Eulàlia’s festivities. As we want you to enjoy it to the fullest, we’ve prepared a list with all the essential things you need to see and do from the 16th to 18th of February. Get ready to enjoy the flashes! During the three nights of the festival you can discover many interesting projects like spaces, projections and shows specifically designed to make the most of the potential of light and color. You will find different options for the entire family, located mainly in Sancho de Ávila, Roc Boronat and Pujades streets. Choose your route and do not miss any corner or patio, all of them will surprise you! Keep your eyes open! Hexx: a light tunnel which reacts to sound. Plaça de les Glòries Catalanes. Follow the Path: animations projected on water. Pond of the DHUB Barcelona. Escletxa Proxèmica: light walls on the sides of an escalator. Hall of the DHUB Barcelona. Hipnocity: facade illuminated with messages to raise awareness about the information barrage we’re living at the present times. CNMC building. Axiom: 3D mapping show that allows, with the help of special glasses, to perceive a three-dimensional effect. Pompeu Fabra University. L’exèrcit de la llum: light suits synchronized with the dancer’s movements. Tànger street, (between Ciutat de Granada and Roc Boronat). You can check the whole programme at Llum Bcn Official webpage, where you can also download it in PDF. If you’re looking for activities for the entire family, Llum Bcn is your plan! During the weekend, different events for all ages, such as immersive projections or 360º experiences, will be organized. Besides, you can play Pix-celona, an app which tests your knowledge about Barcelona. Play with others and discover who knows best! To celebrate the Llum Bcn in Santa Eulàlia’s festivities, many museums and emblematic buildings of the city will have an open-door journey. In many of them, you’ll find interesting activities related to the festival. Some of them are: Montjuïc Castle, located in the highest part of Barcelona, CCCB (Center of Contemporary Culture of Barcelona), Antoni Tàpies Foundation and Joan Miró Foundation (dedicated to both artists), Museum of Catalan History… and many more! Our hostel is one of the establishments that will take part in the the Freedamm programme organized by Estrella Damm. Visit our terrace during the 16th-18th and find out all the surprises we’ve prepared for you! You don’t need big amounts of money for travelling. If you don’t believe it, take a look at this tiny guide we’ve prepared, full of tips for backpackers in Barcelona. Enjoy your trip while you save money for the next one! 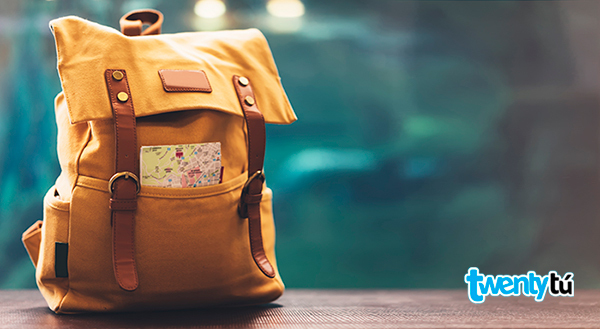 The first thing you’ll need to do as a backpacker is, obviously, prepare your backpack! Do you want some advice to choose the perfect clothes for your trip? Take note! The average temperature is 16.5ºC, which makes Barcelona a great city to discover by foot. The warmest months are from May to September. August is the hottest month, while the coldest ones are from November to February, especially January. Visit Barcelona markets: they’re beautiful and full of life. Besides, their architecture will impress you! Stroll about its neighbourhoods to soak up the culture and habits of the locals. Walk around the Gothic quartier, enjoy the little village of Gràcia and fall in love with the modernist buildings of l’Eixample. And don’t forget Las Ramblas! Feel the nature without leaving the city: take pleasure in a beautiful sunset at la Barceloneta beach or get lost in magic parks, like Ciutadella park. Also, you can enjoy museums, guided tours or tickets for free. You would find more information about the available options on our post 10 free things to do in Barcelona. Tasca i vins: traditional Catalonian food. They have daily menu. Carrer de Blai. This street, very popular among locals, is full of tapas bars. The idea of “tapeo” is having a tapa or a montadito with a small beer (zurito), every time in a different bar. We’re sure you’ll love it! La rosa del Raval: Mexican food like nachos, ceviche or quesadillas. You can have a delicious mojito or margarita for 4euros only! Wok to walk: they serve Asian plates, such as rice or noodles with the toppings you choose, to take away. Mosquito: Asian tapas of very good quality, like dumplings, soups, etc. Nostrum: homemade food from 1€. If you want cheaper options, big supermarkets like Mercadona or Carrefour sell tasty ready-made meals. Walking around in an unknown city is exciting, but also tiring, and maybe at some point of your trip you’ll need to take the metro or bus. Depending on your needs, you can choose one rate or another, but pay attention to tourist transport cards (called “Hola Barcelona), to the T-10 (a 10 trips card) or the daily bonus. Barcelona is very well-connected, and its network includes train, metro, bus, cable car and public bikes (some of them are electric!). If you don’t know which one you should take, you can always ask at tourist offices or at the info points located in metro stations. Don’t forget: the metropolitan area of Barcelona is divided in A, B, C, D zones, and depending on where you’re travelling you’ll need a specific ticket. It doesn’t matter if you’re a backpacker or not: comfort and relax is essential during a trip. If you’re looking for a comfortable and cozy backpackers hostel in Barcelona, Twentytú is your place. Take a look to our hostel facilities and discover why . Barcelona is a warm, open and cosmopolitan city where you’ll feel like at home. We’ve prepared a “must” list, so you can enjoy your trip to the fullest when you are in town. If you follow these advices, you’ll feel like a local! 1.By foot or by metro, you choose! Barcelona isn’t a big city (it’s just a bit bigger than the tenth part of London or New York) so you can visit most of the tourist attractions during a nice walk and decide the things to do in Barcelona. Nevertheless, in case you decide to visit any further place, like the Camp Nou stadium, Park Güell or Montjuïc, you should know Barcelona’s metro system arrives to all the districts of the city and its surroundings. Besides, metro works every day, from 5 am to 12 am (Monday-Thursday and Sunday), from 5 am to 12am (Friday) and during the whole day on Saturdays. You can plan your journey and check all the information at this webpage. If you come from abroad, you should know our timetables are different to the rest of Europe; work usually starts at 9am, lunch is at 2pm and dinner starts at 9pm. That’s why we finish work later and why we are kind of “nocturnal”, so if you want to see a crowded nightclub, you’ll have to wait until 2am!! Usually, the weather in Barcelona is quite nice, with an average temperature of 16°C, with hot summers (average temperature of 24°C) and cool winters (average temperature of 9°C). Anyway, weather is sometimes a bit changeable (but you will hardly ever find extreme temperatures). During winter, wearing a jacket at nights and a long sleeve t shirt in the mornings is a good idea, as temperatures goes down a few degrees during the day. Barcelona is a very touristic city and there’s a pickpocket in every corner. Keep your belongings with you at all times (especially at the beach, metro, bar terraces or places like la Rambla) and never have your wallet in your pocket or in a visible place. Don’t let pickpockets ruin your holidays! In Barcelona we speak two languages, Catalan and Spanish. Knowing some words and expressions in these languages will be super useful when you want to communicate with locals. Ready? There we go! La Pedrera, Sagrada Familia, Park Güell, la Casa Batlló.. there’re so many things to do in Barcelona! For this reason, we recommend you to book tickets and table in restaurants in advance. You’ll skip the queue (most of the times) and make the most of your time in the city. On Sunday, most of the shops, supermarkets or even some restaurants are closed. So, before planning Sunday’s journey, make sure it’s going to be possible or think about a B plan. There’re some exceptions like Maremagnum mall and La Roca Village outlet, which are open every day of the year (except on 25th December). You can also attend cultural events, or visit a museum (most of them are free the first Sunday of each month or every Sunday from 3pm)¡there many things to do in Barcelona! You can check some options on this post about Free museums in Barcelona. If you want to party, Barcelona is plenty of clubs and bars for everyone. Eixample esquerra, Vila Olímpica, Marina…depending on what kind of party you’re looking for, you can go to one or other area. At some discos, it’s compulsory to pay for tickets (and usually they’re quite expensive!). That’s why we recommend you to check their Facebook pages or some specialized webs which offer discounts or even free entrance if you are on the “free list”. Barcelona is an endlessly surprising city, you’ll need to come infinite times to discover all its secrets! You will be always welcome. Don’t forget that you’ll have the best of the stays in Twentytú hostel. Barcelona is an amazing city, where in every corner you can find something unique that captivates and invites you to come back. That is why many filmmakers and producers find in our city the perfect setting for their films and series. Here’s the long list of stories that happen in our city, prepare to be amazed! Get a bowl of popcorn and look for some of these titles shot in Barcelona and its surroundings. In some cases, you can even go on guided tours at the film locations. 3, 2, 1 … action! Although Ryan Reynolds spends the whole film underground, buried in an old coffin, this film was shot entirely in Barcelona for 17 days. Impossible to guess! Christian Bale lost 28kg for his starring role, and even though the fiction is about a city in California, everything was filmed entirely in Barcelona and some cities nearby such as Badalona, ​​Sant Adrià del Besòs, Prat de Llobregat, Sabadell or Terrassa. This famous German novel was taken to the big screen in 2006 and was located in many of the charming streets of the old town of our city. Have a look at one of the final and most controversial scenes, which was shot in Poble Espanyol, did you recognise it? Woody Allen chose the magic of Park Güell, La Pedrera, La Sagrada Familia and some other Barcelona monuments to show us a most peculiar love triangle formed by Javier Bardem, Penélope Cruz and Scarlett Johansson as main characters. Could you imagine a better place for a love story? Two young people, Jack Nicholson and Maria Schneider, act in a plot of espionage that takes them to several cities, including Barcelona, ​​where we can see the state in which La Pedrera was back in 1975, before its last restoration. Awesome! Almodóvar chose Barcelona as the spot where Manuela, the main character of this Oscar-winning drama, overcomes an important loss and since her arrival in the city the film shows us emblematic places such as the Columbus monument, Sagrada Familia, Palau de la Música or Monjuïc’s graveyard, among others. Do you wonder what a devastated Barcelona would look like? If this is your case, don’t miss this film that sets out an apocalyptic future where the streets that we walk on every day are impossible to live in and the survivors only remain alive wandering the underground roads. This film directed by Jaume Balagueró in 2005, which won the Goya Award for the best special effects and was a candidate for the best original music, was filmed almost entirely in Barcelona. This romantic story, based on the book by Federico Moccia, originally takes place in Rome but was filmed in Catalonia, in locations including Barcelona, ​​Sant Boi, Sant Adrià del Besós, L’Hospitalet de Llobregat, St. Feliu de Guixols, St. Cristina d’Aro, Argentona, Teià and Canet de Mar. It’s not difficult to find out that the movie saga was filmed in our city, even Razzmatazz, one of the best clubs in Barcelona, ​​right next to Twentytú hostel. But these films filmed in Barcelona are not the only ones, because there are still many who bet on a location in our city: Barcelona, ​​Biutiful, Bad education, REC, While you sleep, Your life in 65 ‘. Now that the world of the series is so trendy, we don’t want to miss the opportunity to remind you of the series that have been shot, inspired or made reference to our beautiful city. Do you want to see the next episode? This series, which will be released in 2018, will bring to the small screen the novel written by Ildefonso Falcones, which takes place mainly in the Santa Maria del Mar Cathedral of ​​Barcelona. An overproduction that has had 150 actors and up to 4,000 extras! In the fourth chapter of season 25 of The Simpsons Homer receives the visit of a friend of his childhood who wrote letters to him from the top of the Sagrada família, a monument that he eventually visits. In Friends, Joey tells Ross an infallible secret to flirt that consists in telling an emotional story about his stay as a backpacker in Europe. And of course this supposed route includes Barcelona! On the episode 502 of Shin-chan, which is entitled “Hi! Hey, I travel to Spain”, the main character goes on a tour around Barcelona featuring the statue of Columbus, the Ramblas, the Sagrada Família and Parc Güell, and he even learns some words in Catalan! The A-Team also visited Barcelona in a chapter in which they had to releasea plane kidnapped by terrorists that was a few kilometers from El Prat, although mysteriously our modern airport looked like the Amazon rainforest! In the last season of this legendary animation series, Oliver Atom signed up for the very same F.C. Barcelona! However, and given that the producers of the series didn’t buy the club rights of our city, the original names of the club and its players are not shown literally. Therefore, the coach is Van Saal, instead of Van Gaal, and the scorer Rivaul, instead of Rivaldo. In the first season of this series about the Italian mafia, one of its plots is located in Barcelona, ​​a city where a Neapolitan mafia boss runs away to in the middle of a clan war. During hisstay we can see symbols of the city such as the Agbar Tower, the Casino, the Olympic Port or the W Hotel. You can also have a look at this list of series: Emerald city, Merlí, Velvet or How I met your mother, many of them you can find in Salón del cine y las series de Barcelona. With this list of series and movies filmed in Barcelona you have no excuse to fully know all the charm of Barcelona. And if you need a little help to see all the points of interest don’t forget to check our guided tours for Barcelona. You won’t miss a thing!